One of the most striking features in Ross is now known as the Gazebo Tower, and at the time of writing is up for sale for a guide line price of £40,000. In the sale particulars it is described as "a grade II listed building constructed in 1833 as a viewing tower for the popular tourist market town." The tower is built of red sandstone and contains three floors approached by vertical ladders leading to a viewing platform at the top. During the 1830s Ross became 'thoroughly and expensively medievalised' continuing John Kyrle's 'public-mindedness' in beautifying the town and surrounding landscape. 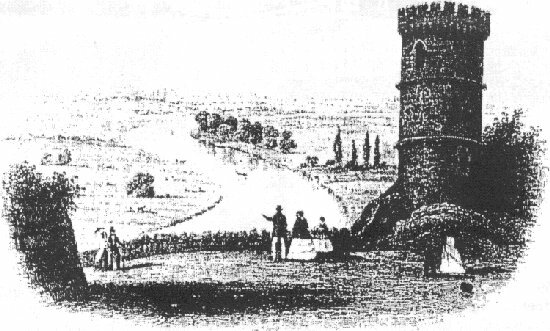 These developments were carried out by the Town Improvement Commissioners and the Turnpike Trustees who succeeded in transforming the western approach into Ross when the new Wilton Road and the road up to Barrett's Royal Hotel were carved out of the sandstone cliff. Presumably the surplus stone was used to construct the mock-gothic stone walls with arrow slits and oriels terminating in the Gazebo Tower. There is pictorial and documentary evidence of two other towers built at this period, one below the Royal Hotel and the other opposite Swan House. It is interesting to consider whether these three 19th century towers had any connection with three towers that stood on Bishop's Court in 1696. They were sufficiently important to have keys and be kept in repair during John Kyrle's lifetime. In 1838 the Gazebo was referred to as 'Mr. Collins Tower', J.S. Collins worked as an attorney in Upper Church Street and served as a Town Commissioner and a Turnpike Trustee. When the Collins family sold 'Palace Pound' house with its "substantially-built Tower, Castellated Buildings, Parapets and Walls" in 1906 the Gazebo was called 'Palace Pound Tower'. Around the same date it was also known as 'Castle Tower' or 'Royal Tower'. By the 1950s the local historian Winifred Leeds called the Gazebo the 'Round Tower' and wrote "In the days of the Ross Volunteers it was known as the Armoury as their equipment was housed there. Of late it has been used as an Arts and Crafts shop and is in private hands, though there is every probability that it may soon be acquired by the Town Council and put into thorough repair." In 1959 it was the owner of Palace Pound Cottage who "gave the tower, together with some feet of land for access" to the Ross Town Council as she felt "the ownership and maintenance of the tower should be vested more appropriately in the community." In the hands of the council the tower became known as the 'Bishop's Tower' in tourist guides, and the tower continued to be used for arts and crafts exhibitions until around 1980. Since then the Gazebo has remained empty but "major repairs were effected on the Tower by the Local Authority in the late 1990s." The town now awaits a future sympathetic use for this famous landmark.